Hey Samurai! It’s Tom from Team Ninja again. Hope you all enjoyed the Dragon of the North release last month. We appreciate the tremendous response from you guys and it’s encouraged us to keep working hard on developing fresh new content for your enjoyment. Having said that, I’m happy to say that we’re putting the finishing touches on our second DLC: Defiant Honor, available from July 25. And I’m really psyched for you guys to jump into this one! This incredible clash would not be complete without providing you with the necessary ammo to wage an intense battle. Therefore, we will be delivering a deadly new weapon Tonfa, new armor, new magic items, guardian spirits and of course brand new Yokai and enemies to test your mettle! New difficulty levels and Trophies will also be implemented for Defiant Honor. Legendary characters such as Sanada Yukimura who will later be revered as “the greatest warrior of all Japan” are included. All this action takes place within exciting new stages and numerous sub-missions! So, there’s plenty of combat to be held and new challenges to be mastered. 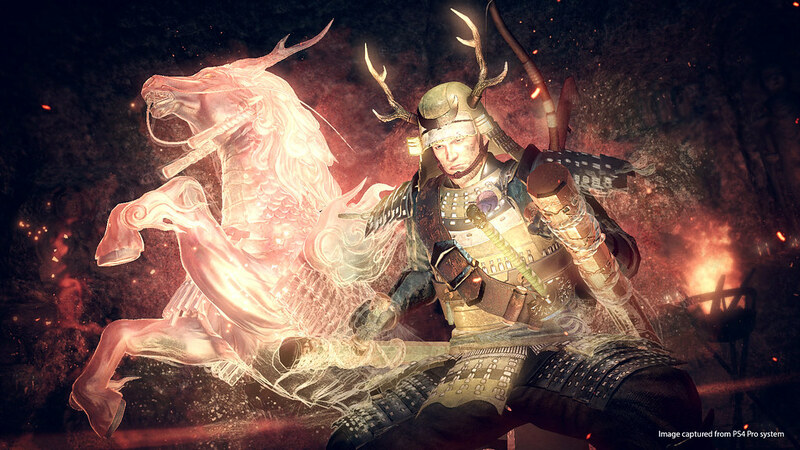 We really hope you’ll enjoy Defiant Honor – available to purchase from PlayStation Store for $9.99, or free if you own a Nioh Season pass. We put a lot into this and we can’t wait for you guys to check it out. So as always, sharpen your blades samurai and good luck defying death! So a winter battle eh, Winter is coming! Congratulations for developing this great game! I’m about to finish the main campaign and can’t wait to play both DLCs. Really enjoyed it! I need to get back to this game. Got side lined when Horizon Zero Dawn came out. The legendary Sarutobi Sasuke appears! Ever since the teaser ending after Dragon of the North, I’ve been realy excited to fight him. Seems like Tonfas will be his chosen weapon, which seems like a nod to popular culture representation of the character. I hope the last DLC, which seems to be a continuation of this story brings the dual kodachi with lots of ninja combat manouvers to the mix because this very much tops the choice arsenal for William in this game. Can’t wait to play it! Nioh is seriously a great game. I didn’t know the 2nd DLC was coming this soon, so I am very happy about that. I’ve cut back my playing in the meantime, only playing every 5 days when the hardest Twilight Mission is available for co-op but pretty soon I’ll be playing every day again. Fantastic job and congratulations, Team Ninja! I want a Yuki-onna one too but that’s a longshot. And is that a new weapon i see? a leaf huh? maybe a fan weapon? that would be sweet too. Already have the season pass, great game. Might be the very first game i ever platinum, just need to collect those teakettle fragments! I wonder how the Tonfa’s will be, i’ve been hoping for a martial arts bare handed class, but maybe the tonfa’s might come close? Hi Team Ninja, great game! We would love to see the female skin transformation being brought into the cutscene as well. After grinding so much for glory for the skin, I think it’s fair to see the female skin into those short video clips as well! Really enjoyable game. I’m even enjoying just helping players. Is it possible to increase the max Ninja and Onmyoji capacity slot? Perhaps something like 10 extra slots for every 20 after 30? Right now 30 for both is all you need. Also the soul release talisman requires serious attention. The max familiarity depletion from it is a waist if it deals the exact damage as one slash from my weapon. Onmyoji needs more damage too as they are only good for debuffs. Also I’d really like an Onmyoji skill to cleanse myself of slows and debuffs like ki depletion as late game these are extremely powerful but can only be waited out. Could you also add in a Ninja ability to set up an oil trap and later set it ablaze with fire? Using fire is a tactic I use when given the option and I find it useful. Also throwing Kayaku and Horoku should at least flinch bosses with their initial blasts. If you wish to fix PVP, I believe the best way is creating a separate character slot where player’s levels are fixed at about 200 where skill points from hair locks were disabled. With armor and weapons being provided by the Arena for obvious reasons. I need to start playing Nioh again. Had to take a break after beating it once. Started getting burnt out on fighting the same few enemies over and over. Does both dlc packs add that many totally new enemies or are they just reskins? I really wish team ninja would go back into the main game and a few different yokia. Don’t get me wrong Nioh is an amazing game with great Devs. Just think the enemy variety is lacking big time. It really bugged me while playing it.